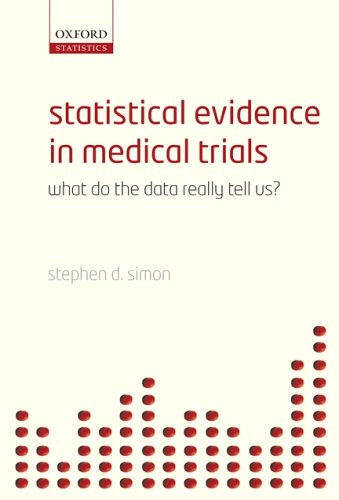 I have written a book, Statistical Evidence in Medical Trials, What Do the Data Really Tell Us? through Oxford University Press. This page has information about my book. Update: October 1, 2008. I have answers to the homework exercises for chapter 7 and I will start soon on the answers for chapter 6. This is about two years too late. Please accept my apologies. Update: January 15, 2008. My main contact at Oxford University Press, Allison Jones, is leaving for a better job at Oxford University. I'm sure that the new person will work out well, but I want to thank Ms. Jones for all her hard owrk on my behalf. Update: November 27, 2007. There are two new reviews of my book, but I have not been able to track them down to see what they say. I understand that my book was reviewed by ACP Journal Club, but I don't have any more information than that. [Update: this is the same review that appeared in Evidence Based Medicine.] Another review written by Nancy G. Berman has appeared in Biometrics 2007 (March) 63(1): 305-306. DOI: 10.1111.j.1541-0420.2007.00743_7.x. It would cost me $44 to get the text of this review, and even my vanity has a price limit. I'll see if I can get it through my publisher. I also found a review in German, but it does not translate well using BabelFish. I still added it to my reviews page. An undated entry about Evidence Based Medicine/Practice on the LibraryLink blog lists my book among seven books for further reading. Update: August 8, 2007. I've sold almost a thousand copies, which puts me at least four orders of magnitude behind J.K. Rowling. I've discovered two new reviews today (Pharmaceutical Statistics and Statistics in Medicine). I've added the citation and brief excerpts to my reviews page. Update: April 9, 2007. I've added another answer to an exercise. Sorry that the progress is so slow! A very strong review just appeared in the journal Evidence-Based Medicine. See my reviews page for details. Update: March 26, 2007. Another review of my book is coming out, this one in issue #5 of the Journal of Biopharmaceutical Statistics. This reviewer (Sunil K. Dhar) notes the typographical errors, but is otherwise very positive. Here's the strongest quote in the review: "The author uses conversational language with a good sense of humor and is able to explain complex concepts using simple stories and amusing anecdotes. This makes the book beneficial, not just for clinical researchers or students, but also as a valuable teaching tool for biostatistics trainers." I'm still behind schedule for writing answers to the exercises. Sorry! The second printing of the book arrived last month, but I have been too busy to look at it in detail. I'm hoping that we fixed all the typos. Update: January 23, 2007. I still have not seen the second printing of the book. Another review is slated to appear in HIV Clinical Trials. I have not seen it on the web yet, but have an advance copy through my publisher. The review is mostly positive, but does offer three major criticisms. My contact at Oxford University Press, Alison Jones, said this represented "useful hints for future editions." Bless her soul!. As more reviews appear, I don't want to use a lot of space on this main page for review comments. My plan is to create a separate page which lists and summarizes the reviews. I also realized that with so many reviews coming out, people will be visiting this webpage and looking for information such as answers to the exercises. My plan is to write one or two answers every day. Update: January 16, 2007. A second printing of the book is ready and I should get a copy soon. There were numerous typographical errors in the first printing, and these have been fixed. There is a review of my book in the February 2007 issue of Technometrics (text not available on the web unless you are a subscriber). It comments on those typos and has other criticisms as well. The reviewer (Richard Goldstein) raises some interesting philosophical viewpoints about research that I highlight in a separate weblog entry. Another review was published in the Baylor University Medical Center Proceedings (2006 October, 19(4): 419, reviewed by Cody Hamilton) and is available in full text or pdf format at PubMed Central. This review is generally positive and includes the nice comment that I have done "a wonderful job of presenting and explaining the relevance of statistical issues in a manner understandable even to those with no statistical training whatsoever." A third review is available on the Short Books Reviews On-Line website sponsored by the International Statistical Institute. The review is indeed short (and anonymous). It is also generally positive and says that I succeed "very well in providing an interesting and informative introduction to the proper assessment of published medical research." Update: November 2, 2006. I have finally started writing a page with answers to the "On Your Own" exercises at the end of most chapters in the book. I only have two answers listed so far, but hope to add quickly. I also updated the page with resources about my book. The full URLs for these two pages appear at the bottom of this page. Update: October 5, 2006. As I noted on my weblog, the International Journal of Epidemiology published a review of my book, Statistical Evidence in Medical Trials, in their September 15, 2006 issue. You need to be a subscriber or pay for access. The review was fairly positive: Here's the last paragraph: "This book is a clear, concise, and interesting read and should prove to be a useful guide. The examples and case studies make it easy to understand difficult concepts and the jokes and stories make it fun. There are some salient points and hopefully the reader will be enthused about looking at the published research and be more confident about distinguishing between the good and the bad." There is also a review from Benoy N. Shah at the UK Amazon site (www.amazon.co.uk). The reviewer noted numerous grammatical and typographical errors (oops!) but was still kind enough to write: "Overall, this book is excellent and I would highly recommend it to anyone wishing to learn more about interpreting clinical research."